The Indian Human Spaceflight Programme (HSP) was created by the Indian Space Research Organisation (ISRO) to develop the technology needed to launch crewed orbital spacecraft into low Earth orbit. The first crewed flight is planned with a spacecraft called Gaganyaan for December 2021 on a home-grown GSLV-III rocket. Before Gaganyaan mission announcement in August 2018, human spaceflight was not the priority for ISRO, though most of the required capability for it had been realised. ISRO has already developed most of the technologies for crewed flight and it performed a Crew Module Atmospheric Re-entry Experiment and a Pad Abort Test for the mission. The project will cost less than Rs. 10,000 crore. In December 2018, the government approved further ₹ 100 billion (US$1.5 billion) for a 7-days crewed flight of 3 astronauts to take place in December, 2021. If completed on schedule, India will become world's fourth nation to conduct independent human spaceflight after the Soviet Union/Russia, United States and People's Republic of China. After conducting crewed spaceflights, the agency also intends to continue with efforts with a space station program and possibly a crewed lunar landing. On 9 August 2007 the then Chairman of the ISRO, G. Madhavan Nair, indicated the agency is "seriously considering" the creation of the Human Spaceflight Programme. He further indicated that within a year ISRO would report on its development of new space capsule technologies. Development of a fully autonomous orbital vehicle to carry a two-member crew into a low-Earth orbit (LEO) began a few months after that when the government allocated ₹95 crore (US$13.2 million) for pre-project initiatives for 2007 through 2008. A crewed mission into space would require about ₹12,400 crore (US$1.7 billion) and a period of seven years for development. The Planning Commission estimated that a budget of ₹5,000 crore (US$695.7 million) was required for initial work on the crewed mission during 2007–2012. In February 2009, the Government of India gave the green light for the human space flight programme, but fell short of fully funding it or creating the programme. The trials for crewed space missions began in 2007 with the 600 kg Space Capsule Recovery Experiment (SRE), launched using the Polar Satellite Launch Vehicle (PSLV) rocket, and safely returned to earth 12 days later. This followed with the Crew Module Atmospheric Re-entry Experiment, and the Pad Abort Test in 2018. This enables India to develop heat-resistant materials, technology and procedures necessary for human space travel. Defence Food Research Laboratory (DFRL) has worked on the space food for crewed spaceflight and has been conducting trials on G-suit for astronauts as well. 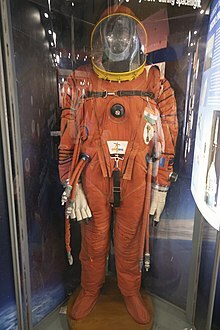 A prototype 'Advanced Crew Escape Suit' weighing 13 kg was built by Sure Safety (India) Private Limited based on ISRO's requirements has been tested and performance verified. Having shown success in all preliminary tests, the decisive push for the creation of the Human Spaceflight Programme took place in 2017, and it was accepted and formally announced by the Prime Minister on 15 August 2018. On December 28, 2018, the Indian Union cabinet approved the funding for Indian Space Research Organisation's (ISRO's) human spaceflight programme, under which a three-member crew will be sent to space for seven days and is expected to cost Rs 9,023 crore. The testing phase is expected to begin from December 2020 and the mission will be undertaken by 2022. Michael Clark talks about India's Human Spaceflight Programme and the rockets that will enable them. The first phase of this programme is to develop and fly the 3.7-ton spaceship called Gaganyaan that will carry a 3-member crew to low Earth orbit and safely return to Earth after a mission duration of a few orbits to two days. The launch is planned for December 2021. The extendable version of the spaceship will allow flights up to seven days, rendezvous and docking capability. Enhancements in spacecraft will lead to development of a space habitat allowing spaceflight duration of 30–40 days at once in next phase. Further advances from experience will subsequently lead to development of a space station. On October 7, 2016, Vikram Sarabhai Space Centre Director K. Sivan stated that ISRO was gearing up to conduct a critical 'crew bailout test' called ISRO Pad Abort Test to see how fast and effectively the crew module could be released safely in the event of an emergency. The tests were conducted successfully on 5 July 2018 at Satish Dhawan Space Centre, Sriharikota. This is the first test in a series of tests to qualify a crew escape system technology. India will not use any animals for life support systems testing but robots resembling humans will be used. ISRO is targeting more than 99.8% reliability for its crew escape system. As of August 2018, ISRO plans to launch its crewed orbiter Gaganyaan atop a Geosynchronous Satellite Launch Vehicle Mk III (GSLV Mk III). About 16 minutes after lift-off, the rocket will inject the orbital vehicle into an orbit 300 to 400 km above Earth. The capsule would return for a splashdown in the Arabian Sea near the Gujarat coastline. Human-rating rates the system is capable of safely transporting humans. ISRO will be building and launching 2 missions to validate the human rating of the GSLV-MK III. Existing launch facilities will be upgraded to enable them to carry out launches under Indian Human Spaceflight campaign. The escape system will boast of a recently included geometry. Work on parachute enlargement and new architecture are also going on. ISRO Chairman, K. Sivan, announced in January 2019 the creation of India's Human Space Flight Centre in Bangalore for training astronauts, also called vyomanauts (vyoma means 'space' or 'sky' in Sanskrit). The ₹1,000 crore (US$139.1 million) centre will train the selected astronauts in rescue and recovery operations, operate in zero gravity environment, and monitoring of the radiation environment. An astronaut training facility will be established on proposed site of 140 acres (0.57 km2) nearby Kempegowda International Airport in Devanahalli, Karnataka. In spring 2009 a full-scale mock-up of the crew capsule was built and delivered to Satish Dhawan Space Centre for training of astronauts. India will be short listing 200 Indian Air Force pilots for this purpose. The selection process would begin by the candidates having to complete an ISRO questionnaire, after which they would be subjected to physical and psychological analyses. Only 4 of the 200 applicants will be selected for the first space mission training. While two will fly, two shall act as reserve. ISRO signed a memorandum of understanding in 2009 with the Indian Air Force's Institute of Aerospace Medicine (IAM) to conduct preliminary research on psychological and physiological needs of crew and development of training facilities. ISRO is also discussing an agreement with Russia regarding some aspects of astronaut training. On 7 November 2018, ISRO released an Announcement of Opportunity seeking proposals from the Indian science community for microgravity experiments that could be carried out during the first two robotic flights of Gaganyaan. The scope of the experiments is not restricted, and other relevant ideas will be entertained. The proposed orbit for microgravity platform is expected to be in an Earth-bound orbit at approximately 400 km altitude. All the proposed internal and external experimental payloads will undergo thermal, vacuum and radiation tests under required temperature and pressure conditions. To carry out microgravity experiments for long duration, a satellite may be placed in orbit. ^ a b Rao, Mukund Kadursrinivas; Murthi, Sridhara, K. R.; Prasad M. Y. S. "THE DECISION FOR INDIAN HUMAN SPACEFLIGHT PROGRAMME - POLITICAL PERSPECTIVES, NATIONAL RELEVANCE AND TECHNOLOGICAL CHALLENGES" (PDF). International Astronautical Federation. ^ a b c d "Rs 10,000 crore plan to send 3 Indians to space by 2022 - Times of India". The Times of India. Retrieved 29 December 2018. ^ a b c Gaganyaan mission to take Indian astronaut to space by 2022: PM Modi. The Hindu. 15 August 2018. ^ a b "Gaganyaan mission to take Indian astronaut to space by 2022: PM Modi". The Hindu. 15 August 2018. ^ "Independence Day 2018 Live Updates: 'We will put an Indian on space before 2022,' says Narendra Modi at Red Fort". Firstpost.com. Retrieved 15 August 2018. ^ "Satellites Are Our Priority Now, Not Human Space Flight". Outlook. Retrieved 21 July 2017. ^ a b "ISRO's first 'pad abort' test, critical for future human space mission, successful". The Hindu. 5 July 2018. ^ a b "Indian Astronaut Will Be In Space For 7 Days, Confirms ISRO Chairman". ^ a b Suresh, Haripriya (15 August 2018). "JFK in 1961, Modi in 2018: PM announces 'Indian in space by 2022,' but is ISRO ready?". The News Minute. ^ Indians To Spend 7 Days In Space In Rs. 10,000 Crore Gaganyaan Plan: 10 Points, NDTV, 28 Dec 2018. ^ "ISRO Looks Beyond Manned Mission; Gaganyaan Aims to Include Women". ^ "ISRO considering manned space mission: Nair". The Hindu. Chennai, India. 9 August 2007. ^ "Eleventh Five year Plan (2007–12) proprosals for Indian space programme" (PDF). Retrieved 21 June 2013. ^ "ISRO plans manned mission to moon in 2014". Business Standard. ^ "Def lab works on food for spaceflight crew". The New Indian Express. Retrieved 18 August 2018. ^ "Dosa or dum aloo. What will India's first astronauts eat?". dna. 19 March 2010. Retrieved 18 August 2018. ^ "AHMEDABAD DNA G & G [PG 16] : Vadodara-based company develops space suit for ISRO". epaper.dnaindia.com. Retrieved 18 August 2018. ^ "Gujarat's firms helping ISRO shape up 'manned space mission'". The Indian Express. 3 November 2015. Retrieved 18 August 2018. ^ "Government of India,Department of Space, Unstarred Question number 213 LokSabha" (PDF). 16 November 2016. Archived from the original (PDF) on 19 August 2018. Retrieved 19 August 2018. ^ "ISRO to send first Indian into Space by 2022 as announced by PM, says Dr Jitendra Singh" (Press release). Press Information Bureau, Government of India. Department of Space. 28 August 2018. ^ "Indian will take national flag to space on board Gaganyaan by 2022, says PM Narendra Modi in Independence Day speech". Hindustan Times. 15 August 2018. ^ "Cabinet Okays ISRO's Human Spaceflight Programme for Rs 10,000 Crore". The Wire. Retrieved 30 December 2018. ^ a b c "Isro to build 3 sets of rockets, crew modules for Gaganyaan - Times of India". The Times of India. Retrieved 30 December 2018. ^ "ISRO to launch two unmanned space missions in 2020 and 2021". All India Radio. ^ "We're talking of habitation on moon, Mars…we have to know how to adapt: ISRO chief K Sivan". ^ "ISRO Not To Fly Living Being Before Actual Manned Space Mission: Official". NDTV.com. Retrieved 16 September 2018. ^ "ISRO to use a humanoid, not animal, for Gaganyaan tests". ^ "Suits from Vadodara, parachutes from Agra: Inside ISRO's plan to launch India's first astronauts". ^ Peri, Dinakar (28 August 2018). "Manned space mission before 75th I-Day: ISRO chief". The Hindu. ISSN 0971-751X. Retrieved 29 August 2018. ^ "India's human space programme gets a fillip". Retrieved 11 January 2019. Initially, the plan was the construct a new launch pad for the human space flight, but Sivan told the Express that due to paucity of time one of the two existing launch pads is being modified to meet the requirement. ^ "Question number 1733 in Rajya Sabha" (PDF). Retrieved 11 January 2019. It is proposed to utilise the existing launch pad with augmentation for carrying out the initial flights under the Gaganyaan manned space flight programme. ^ "Agra lab parachutes to bring back India astronauts". Deccan Herald. 4 January 2019. Retrieved 11 January 2019. ^ ISRO set for April launch of Chandrayaan-2 after missed deadline. Vikram Gopal, Hindustan Times, 11 January 2019. ^ "Beyond space: Isro plans to place Indians on the Moon - Times of India". The Times of India. Retrieved 12 January 2019. ^ "IAF developing parameters for India's manned space mission". The Economic Times. 28 December 2012. Retrieved 28 December 2012. ^ "The Space Review: Prospects for the Indian human spaceflight program". www.thespacereview.com. Retrieved 18 August 2018. ^ "Isro unit to start building space capsule for manned mission". Livemint.com. Retrieved 18 August 2018. ^ Russia may train Indian astronauts at ISS. Anirban Bhaumik, Decan Herald. 30 September 2018. ^ Russia To Help India In 2022 Space Mission: Russian Envoy. NDTV 3 December 2018. ^ "Announcement of Opportunity (AO) for Low Earth Orbit based Microgravity Experiments - ISRO". ^ "Human Mission: ISRO looking at pool of 10 experiments in space". Hindustan Aeronautics Ltd (HAL) hands over the first ‘Crew Module Structural Assembly’ to ISRO. February 13, 2014. This page was last edited on 4 February 2019, at 20:57 (UTC).